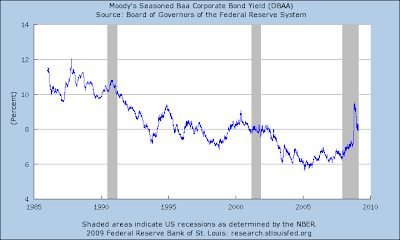 EconoSpeak: Capturing the Success of Non-traditional Monetary Policy: Are BAA Interest Rates a Good Metric? There needs to be some adjustment. Many AAA firms are now down rated and so the type of firm that got a low bond rating has shifted somewhat. This means that the pool of firms has shifted. Perhaps it is appropriate to think of many blue chips as now having weakened financial positions, but I just can't lump firms such as Alcoa in with the typical go-go firm that used to be the ones in this category. Having a few poor years while you still are in possession of a huge capital investment and resource deposits is a different matter than being say, Macy's, which depends upon a continual flow of sales to deal with its debt. Perhaps I'm just unwilling to acknowledge the new reality, but I think the ratings agencies are too focused on short term measures and this distorts their decision making. Even with such an adjustment, I think the major point being made would still hold true, however.